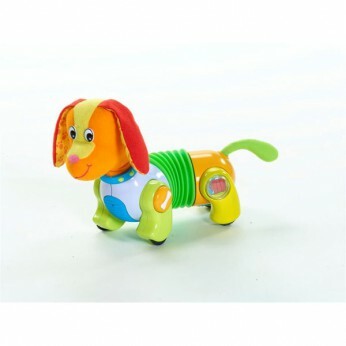 Electronic dog comes with adjustable speed control, a touch-sensitive accordian-shaped body ready for multi-directional movement, and onboard tunes and sounds. Encourages baby to crawl while developing coordination, fine motor skills, cognitive abilities and social interaction. Batteries included. Also available in Follow Me Fiona in Pink. Suitable from 6 months+…. This Tiny Love Follow Me Fred multi stage crawling companion has a baby activated electronic dog with adjustable speed control. Press to play a friendly tune; Adjustable speed control; Batteries required: 1 x AAA (included); For ages 6 months and over. EAN: 0735259004461 * 3975541 18.99. This toy costs approximately £14.99 (for the latest and best prices make sure you check our retailer list for the Tiny Love Follow Me Fred above). In our review of Tiny Love Follow Me Fred we classed it as being suitable for ages 0 to 11 months but recommend you check the manufacturer specific advice before purchasing.